What was mentioned in the “Get Started” page is the basics of what you need to start drawing. In this page, you get to know in detail of the different types of drawing materials that helps you learn and progress in your drawing skills. – Bring along a small piece of the drawing surface that you use. – Try out different types of drawing medium (wet, dry) on different surfaces if possible. If you have no access to an art store or you don not live near one, we recommend you to buy your drawing supplies online.There are many online store that sells drawing supplies and most of them with reasonable prices. Check out the “Resources” page for online stores that sells drawing materials and supplies. Not all paper are the same. And not one paper is suitable for every medium. Therefore, having the right paper for either dry (pencils,charcoal,etc.) or wet(inks, water color, markers,etc.) medium is essential for your drawings. Get to know the right paper for you, what paper surface is best used with different mediums.Also learn to avoid making the mistakes that most beginners and intermediate artist make. Drawing pads are recommended for beginners as they are cheaper and easier to store.Most drawing pads comes with a hard cardboard backing so it gives you a good support if you were to draw while holding the drawing pad and protect the paper and your drawings. Once you have improved on your drawing skill, consider a certain quality paper that is available only as individual sheets.Best to do your sketches in the drawing pad and use the individual paper if you want to work on something serious that involves inking or coloring.But before you actually buy the piece, you might want to try it out and see if the paper is to your liking.this can be done at the art store selling it.Individual sheets usually comes in large pieces and can be somewhat expensive.Therefore, you might have some difficulties in transporting it from the art store to your place(unless you want consider the pay-per-cut service). You can always get the sheets rolled up but be sure to wrap the roll so that it doesn’t get damaged when you move it around. In term of how large or small your drawing paper should be, it usually comes down to how often you draw . If you like to spend around 15 to 45 minutes on drawing, then a normal sized drawing pad will do.But if sketching around for hours is more your style then a drawing block will be sufficient for you.You must also take into account on how much space you use per paper.A lot of people tend to leave out large areas/space when drawing and often using only half of the paper before moving on to another one.This is clearly an unnecessary waste be it a quality paper or not.What we recommend is to allocate and think of what you want to draw before you get to work and use as much space as possible for each paper.Use up the areas you can’t draw on by writing up some note on what to improve in the future.By doing this, you will be surprised at how well you save up on papers. Smooth surface papers are best used for drawing that is more refined or detailed with different dark and light values.Papers with this type of surface is great to use with sharp or very refined lead because it gives you the advantage of control when drawing details.If you are working on drawing details like the eyes, hairlines or those small bit of stuff, then drawing on this type of surfaced paper is recommended.But shading can be difficult mainly because of the almost wax-like attribute of smooth surfaced papers as it does not hold the lead particles.With that,any touch-up done on the drawing can be quite tricky,because the values don’t blend in as easy compared to others. Unlike smooth surfaced paper , “Textured” or rough surface papers hold the small and medium lead particle better and are great to use with soft drawing pencils as shading and blending are easier than most smooth surface papers.Because the rough surface paper have a coarse and more “toothy” texture, the surface tend to “eat” up the tip of drawing pencils making it hard to draw details. 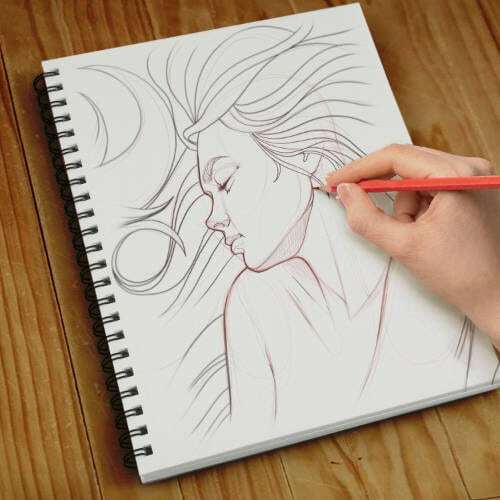 It helps to know the surface types of paper but it doesn’t matter as much if you are a newbie as using the standard drawing pad is sufficient.Though as you progress, you may start to feel comfortable to draw or sketch on a specific type of paper.That is when you may want to change to the paper of your liking. Sketching paper: A good all-around light textured drawing surface paper that works great with dry media and can withstand some amount of wet media.Most used this paper for sketching (hence the name) and would opt for drawing papers for a more serious drawing. Drawing paper: Similar to sketching paper, drawing paper can hold up if used with moderate amount of wet media but more suitable for dry media.It is more commonly used because of its higher quality compared to sketching paper and is also suitable for sketching though rarely used as such. Bristol board: Usually comes in smooth and rough textures, the use of wet and dry media depends on which textures you use.For inks,pencil and fine detailed illustrations is best done with smooth surface.Because of the “toothy” textures, the rougher surface is more suitable for both dry media as well as wet media. Newsprint paper: Commonly known for its gray tint , newsprint paper is available in both smooth and rough surfaces.it is great for sketching and practicing out. Although economical, it is thinner and less durable than most paper making it less suitable for wet medium. Tracing paper: Great for tracing over your work because of its transparency, this paper’s surface is lightly textured, suitable for pencils and thin markers . If you noticed, some papers tend to turn brown or yellow and its quality deteriorate over time.That is because most papers are made using wood-based pulp that contains lignen(a natural chemical compound that can cause such effect)Be sure to get the type of surface paper you want that is mark with either “pH neutral” or “acid free”. That way you can avoid having your artwork damaged when it is not kept properly.